The Herbert L. Pratt residence designed by James Brite c. 1908 at 213 Clinton Avenue in Brooklyn, New York City. 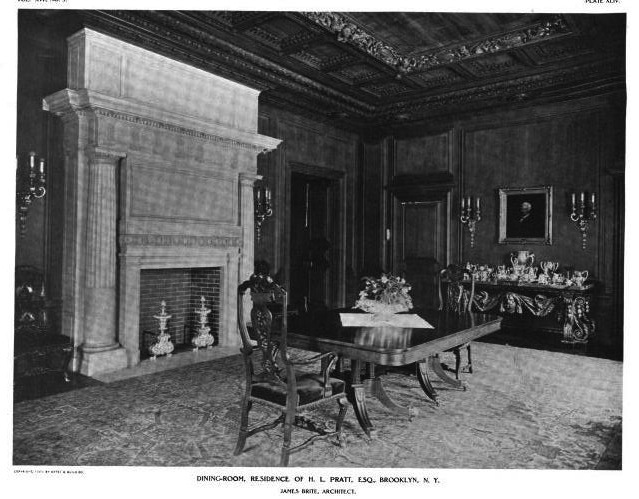 Herbert left Brooklyn for an apartment at 640 Park Avenue in 1914 and the Brooklyn residence was demolished in 1942. 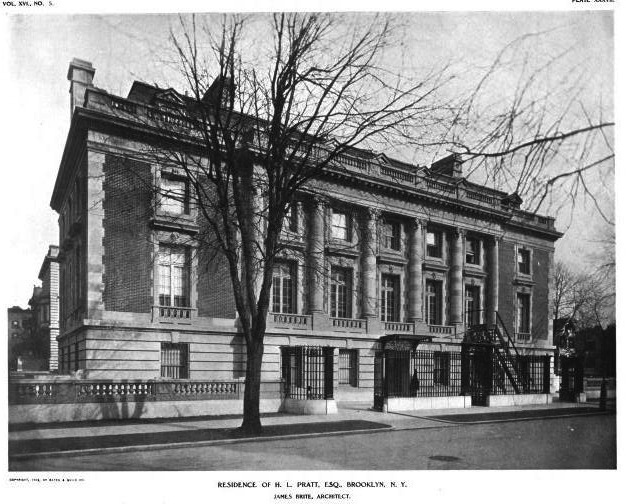 Click HERE for a Christopher Gray Streetscapes article on the Pratt houses of Brooklyn. 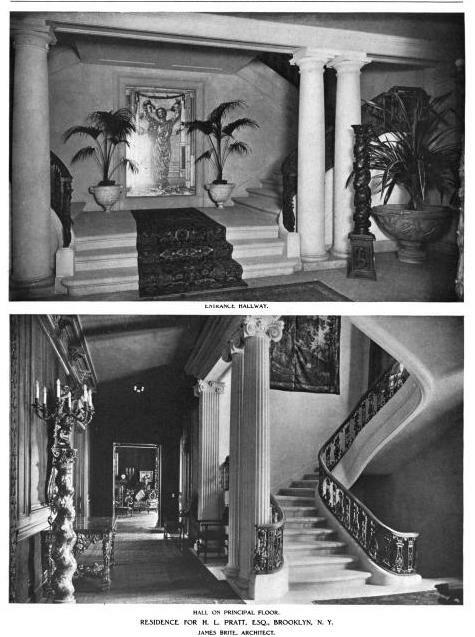 Photos from Architectural Review, 1909. Vaguely heard of this one. Like the design, its not outstanding but very stately. I'm gonna look this one up. The Pratts greatest contribution to Brooklyn and New York aside from their collection of houses is Pratt Institute, located just around the corner in their Clinton Hill Neighborhood. Good memories of antiquated Higgins Hall before the renovations scrubbed it clean and of the brownstone rows of Clinton Hill. Must be Bacon & Brite week at BtGA. Odd that they would have the ground floor plan and second floor plan, but not a first floor plan. It seems to me like there is a piano nobile floor that is missing between these two. NYarch you are right. Brooklyn does have some incredible brownstone neighborhoods and the eclectic homes in Park Slope, Clinton Hill, Fort Greene, Bed-Stuy, Boerum and Cobble Hills, Crown Heights and Brooklyn Heights can rival some of the best in Manhattan. Most benefitted from the general decline of Brooklyn through the 1950's and 60's not undergoing renovations or improvements only to re-emerge intact in the 80's when the borough was re-discovered. The addition of the interior photos and floor plans of the Pratt house, not posted yesterday, are fantastic finds. Brooklyn Heights was also New York City's very first designated historic district (1965). Zach- as usual, great post. 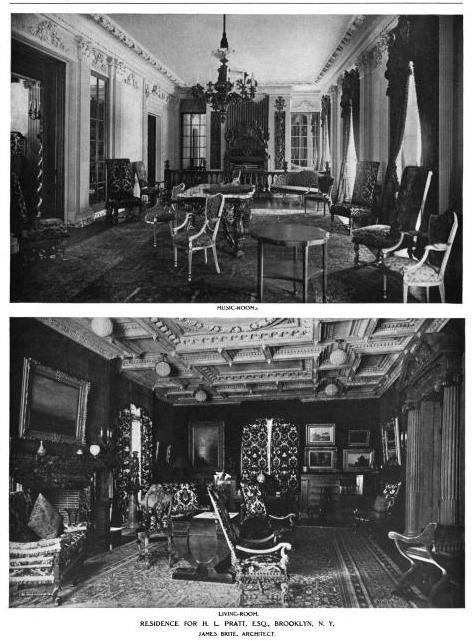 Do you have any idea of what became of the house between the Pratt's departure in 1914 and its demolition in 1942? The Pratts apparently remained at 640 Park Avenue for only a year before moving into the entire top floor at 907 Fifth Avenue- an apartment that boasted an enfilade of Library, drawing room and reception room that ran 102 feet along the 72nd street side of the building. It seems that they liked things big.